In a world where long hours and sleep deprivation are the norm, and constant hustle is essential to workplace success, stress, anxiety and career burnout are at an all-time high. Those who have felt the adverse effects of this always-on economy are turning to one of the happiest nations in the world for inspiration – Denmark. As people realise the importance of self-care and mental wellness, one Danish concept comes under global spotlight. Hygge (pronounced Hue-gah or Hoo-ga), is a reminder to stop and enjoy the little things in life. Hygge is difficult to define, because it cannot be directly translated – but we have all felt it at some point. It is a moment of perfect cosiness, contentment and well-being afforded by simple pleasures. Think rainy Saturdays with a good book. Think bedtime stories with your little ones. Think delicious food, fluffy blankets, an evening spent with loved ones – and you’ll know exactly what hygge is. People usually associate hygge with being at home, or on a holiday in a cosy cabin somewhere far from the bustling crowds. Workplaces are seldom considered very ‘hyggelige’ (hygge-like). For most people, offices are where one experiences maximum stress – they are where one goes through the toughest meetings, the most pressing deadlines, the worst of Monday blues. Even when one is celebrating a fantastic new win or a successful project, the feeling is that of exhilaration and adrenaline – not cosiness and comfort. Emotions are high and extreme, which can prove to be quite draining for employees. A study conducted in 2017 showed that 72% of employers in Singapore were impacted by mental stress faced by employees.1 Stress-induced health issues, reduced immunity and depression resulted in absenteeism, decreased productivity, spiked medical insurance rates and other expenses. Comfortable spaces enable employees to work better and faster, thereby boosting workplace productivity. They ease workplace stress and offer a sense of security and stability, which can be particularly inspiring for those working in creative roles. They create a feeling of togetherness, which helps people bond and promotes collaboration. A happy workplace boosts employee satisfaction, which in turn helps firms retain talent. Given that hyggeligt elements like blankets, candles and casual attire go against many firms’ corporate ethics and safety codes, here’s how one can incorporate this Danish philosophy into the workplace. The perfect lighting is the top priority for achieving hygge. There is nothing more unpleasant than harsh overhead lights that subject employees to direct glares or extremely dim lamps that cause headaches and eye-strain at the end of the day. Hygge is all about comfort and ease – so the ideal lighting solution for a workspace would be bright enough to comfortably work by, and allow easy adjustment as the shadows change through the day. Being surrounded by nature has a calming effect on people and helps soothe day-to-day stress. Think wooden accents, earthy tones and greenery incorporated into the office design. The new Prudential WorkPLAYce is a great example. 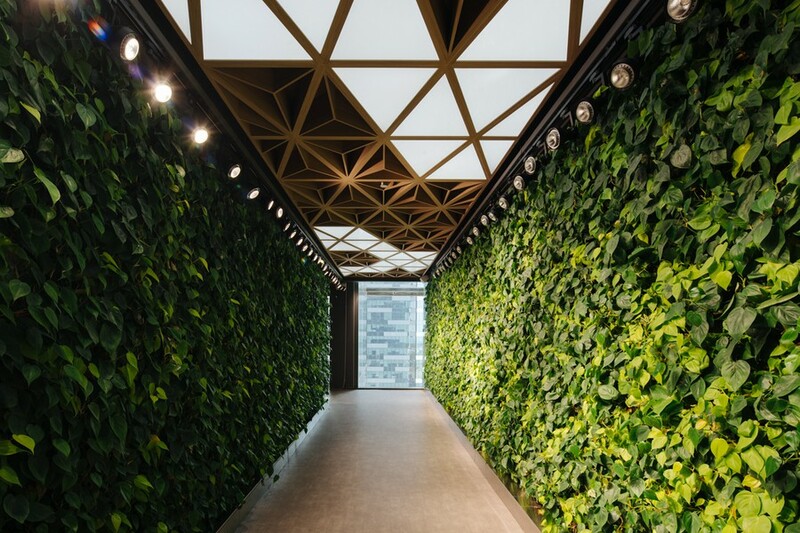 Inspired by nature, the design team at Space Matrix created walkways covered in lush greenery, fitted with motion sensors that trigger the chirping sound of birds. Another linkway in the office features water cascading down the walls, giving it a pleasant waterfall-like effect. Cosy, nurturing and very hyggelige, this innovative design won the award for ‘Best Office Interior: Singapore’ at the 2018 Asia Pacific Property Awards. 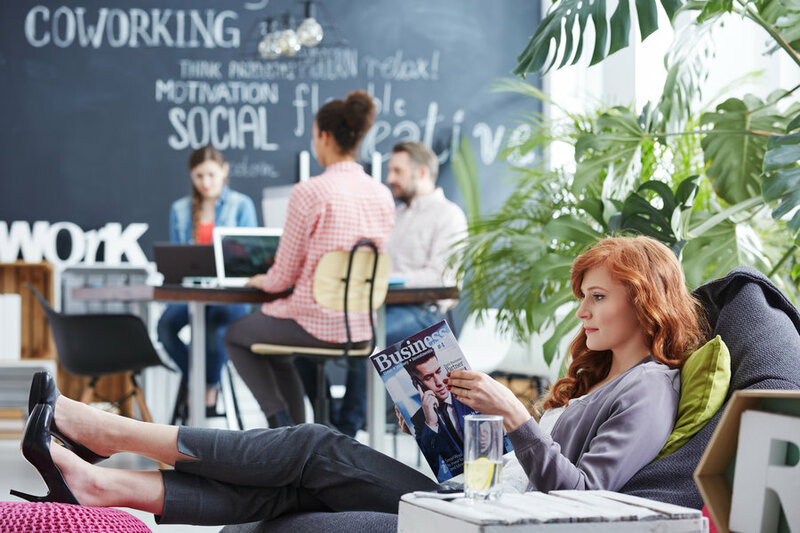 While open areas are great for brainstorming and collaboration, people also need spaces where they can recharge and focus on individual work. For Weber Shandwick’s Gurgaon office, we created cosy wood-panelled nooks, with sofas, lots of cushions and diffused lights, where employees can park themselves when they have long reports to read, or even catch a power nap if they find themselves working late. Researchers found that almost 86% of Danes associated hygge with hot drinks, be it tea, hot chocolate or the national favourite – coffee.3 Cake and pastries are extremely hyggelige too, and can be found in copious quantities in most Danish offices. Having a well-stocked kitchen is an easy way to make a workspace cosier. When designing the cafeteria for Olam, Singapore, we modelled it like a cosy cafe. 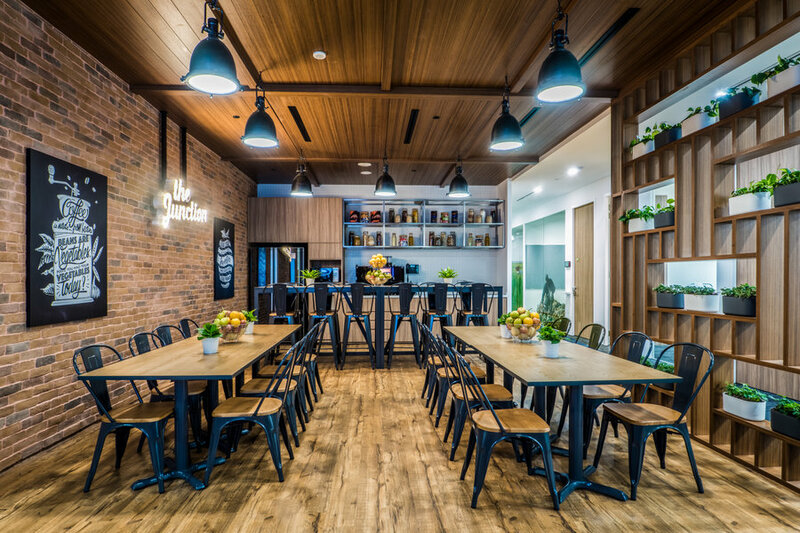 With exposed brick walls, fun posters, plants and of course, a state-of-the-art kitchen, ‘The Junction’ is a place where colleagues can eat, chat, or take a breather in the middle of a hectic day. Nothing negates the feeling of hygge like an environment that promotes toxic competition and rewards one-upmanship. It is essential to complement cosy workspaces with policies that encourage collaboration and build a culture where helping each other is the norm. Egalitarian work structures, transparent review processes, and flexible hours that give people the freedom to work without sacrificing their family time are a few progressive policies that forward-thinking companies are adopting. 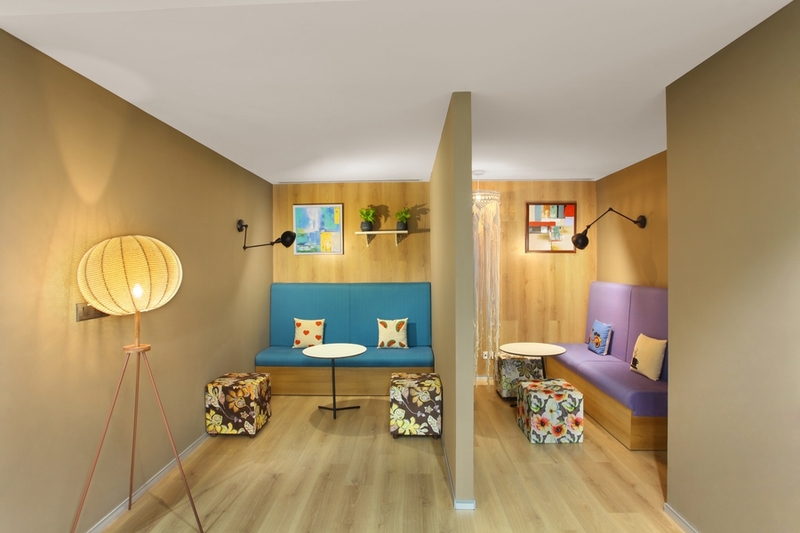 Excited to explore the concept of hygge through your workspace design? Reach out to us for a consultation.